The Music program currently shares a room with the Spanish program because the two programs are very closely linked. They are taught at the same time by the same teacher. 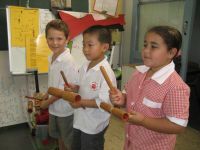 Each class has an hour of Music taught in Spanish per week. 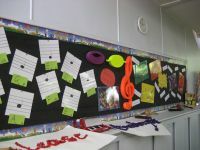 The new Music Room is located in the gymnasium complex with an operable wall which opens up on the main gymnasium, which has a floor level approximately 30cm lower. 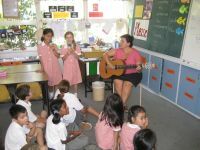 This allows the Music Studio to become a stage for performances by school groups or invited artists. The Gymnasium will be able to house the entire school for these performances.